The main feature of the Amashova Classic route is the dramatic physical changes in the second half of the race. True, the route follows the notorious Comrades Marathon route by and large, but there are variations and there are exceptions. The beauty of the Valley of a Thousand Hills has no equal, the warmth of the spectators has no peer. On foot or on a bike this is a special race. The start is in Chief Albert Luthuli Street, formally known as Commercial Road. The familiar backdrop of the Pietermaritzburg City Hall adds to the atmosphere of excitement, pomp and ceremony. The uninitiated may be forgiven for complaining in the opening 14 kilometres, for while the race should be a downhill flight into Durban you are faced with a demanding climb out of Pietermaritzburg. Fox Hill presents an early and stern test. Pass this and the balance of the journey will prove memorable. Once over Fox Hill there is a comfortable drop to Thornville and welcome relief as you speed past the first watering point outside the chicken farms. Onward, ever onward, to Camperdown where you take a left turn to join the R103 and the Comrades Marathon route. This is chicken-farm country as the race heads into a delightful village filled to capacity with cheering spectators, the air thick with the smoke of breakfast braais. The Cato Ridge Hotel cuts steep black and white angles against the sky as the route descends to the underpass, back onto the northern part of the N3 highway. This is the start of Harrison Flats, a singularly barren stretch between the undulating grassland behind you and the Valley of a Thousand Hills ahead. This is a good section to settle into a rhythmic cadence, check through the race schedule and simply enjoy the morning. On to the mighty Inchanga. Here you will encounter a tunnel of wildly cheering school children from the Ethembeni School for the Physically Disabled and Visually Impaired. This is a special place of reflection for these children are either on crutches or in wheelchairs. The noise is great and the excitement tangible as you pass through this celebration. Many will find great mental and spiritual upliftment here. Inchanga is a notorious hill and the slow climb past Byat’s Store is tough. This landmark no longer stands but it is still acknowledged by campaigners of old. By now the sun is sitting high and the day is warm. There are two steep climbs up the Inchanga Bank and then the descent into Drummond. From this vantage point you can see the highway far below with Drummond in the distance. There is a wall of sound from the dense crowds of spectators as riders encounter the festivities that make up the excitement of reaching the third watering point. At Drummond the Valley of a Thousand Hills spreads out majestically to the north. All too quickly the swirl of sound, smell and colour passes, for the climb out of the Drummond bowl is punishing. Not far off is the Comrades Wall of Honour, where all Comrades runners are immortalised. Across the valley is the Alverstone Tower and the sweeping descent past the Rob Roy Hotel. This is the most scenic part of the Amashova route and it is a good time to savour the moment. Near the top of Botha’s Hill is Kearsney College where well-groomed, uniformed lads from the college line the road. Somewhat more restrained than the children at Ethembeni, it is still a warm and enthusiastic welcome as the downhill ride begins in earnest. 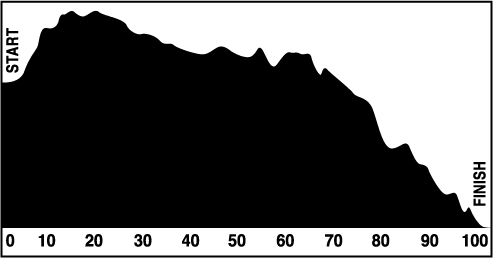 The descent of Botha’s Hill is steep and very fast, a biker’s challenge. At the bottom of Botha’s Hill comes a right turn into Kassier Road and a pleasant ride around Hillcrest to avoid the traffic. Soon enough you link up with the M13 highway and speed on to the Gillitts watering point. To meet Fields Hill on cyclists’ terms is a challenge of another type. Spare a thought for those brave Comrades who passed this way earlier this year. Now near the end, the road gently meanders downhill along the M13, where there are lovely, easy free-wheeling stretches through populated areas as residents urge tired cyclists on to Durban. The final 40 kilometres are a cinch after all the hard-fought Comradely battles, now left behind only as a memory. The last part of this extraordinary journey is cycled on the highway. The pull up to Tollgate, the last of the testers before the final push into Durban, is exhausting. Now with Durban in full view, the Amashova is almost at an end. Suncoast Casino and Entertainment World is not far off. All too soon there is the Old Fort Road and Masabalala Yengwa Avenue; formally NMR Avenue. The race will end outside the new soccer stadium and you will then have to ride on to the Suncoast Resort. Thanks to the full official endorsement, support and enthusiasm of both Pietermaritzburg and Durban cities, the route enjoys full road closure, giving you the freedom of the road for 106 exhilarating kilometres. There are prizes for category winners. Transport is provided to the start in Pietermaritzburg from Durban on the morning of the race. Forms are easily downloaded from the Amashova website. The Amashova Classic has been consistently ranked in a number of our surveys as a well- organised and well-presented event. This is a well-established fixture and will be staged for the 33rd time in 2019. From an old Comrades runner to a novice cyclist, what could be more exciting and interesting than riding down the famous Comrades Marathon route? Echoes of battles fought and won. Scores settled on the Old Main Road. The ghost of Wally Hayward, the spirit of Bruce Fordyce. This is the Amashova, a cycle race through the most beautiful of African valleys, along a road steeped in athletic history. And the cyclists are the lucky ones. You can drink in all of this without the pain of the punishing, bone-jarring descents of your running cousins. Part and parcel of the Amashova is a 38 kilometre ride staged at the same time. Registration details are the same as the main event. The race starts at 05h30 in Hillcrest and follows the route of the main race to the finish.The Green Number Club awards race numbers in perpetuity to cyclists who have finished 10 Classics. The race carries a strong commitment to social responsibility and amongst other projects; the Rotary Club of Hillcrest and Pietermaritzburg as well as the Cycling Club in the Valley of a Thousand Hills are beneficiaries.